The on-off relationship between Microsoft and Yahoo has been consummated. A new 10-year deal will bind the two companies as they seek to compete with Google. In January 2008, Microsoft originally offered $47.5 billion to buy Yahoo outright. Despite Yahoo’s ongoing financial difficulties, the deal was rejected because co-founder and then director Jerry Yang demanded more money. 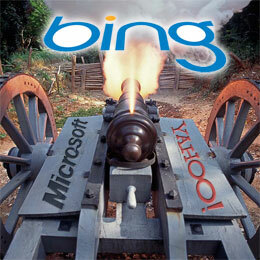 Bing will become the search engine used by both Microsoft and Yahoo. Microsoft AdCenter will become the single search advertising platform. Yahoo will focus on media, marketing services, and sales. Bing usage has been growing at an average of 25% per week. However, this has primarily been at the expense of Yahoo Search and it is yet to dent Google’s market share. The deal will instantly provide Bing with almost 30% of US internet queries and save Yahoo $200 million in search engine technology development costs. Advertising prospects for the combined systems should also improve. Yahoo and Microsoft both offer effective search advertising platforms, but advertisers often choose Google because it receives significantly more traffic. However, the link up will not be easy and both companies expect scrutiny from the US Department of Justice. The Google-Yahoo advertising alliance failed in November 2008 partly because of DoJ opposition. Ironically, Microsoft was the biggest and loudest complainer about that deal. Assuming the legal, technical, and structural details can be overcome, the Microsoft-Yahoo collaboration creates a far more powerful competitor for Google. That will be welcomed throughout the industry, but can the companies work together effectively and beat Google in a market it dominates?